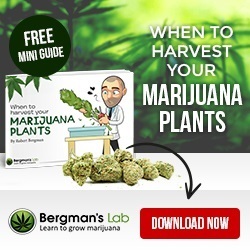 A highly stable autoflowering strain that grows and flowers simultaneously, reducing the overall time from germination to harvest to an absolute minimum. Lowryder seeds contain 80% Indica and 20% Ruderalis genetics, generating an automatically flowering squat dwarf plant with spicy flavored buds. The plants reduced, mature height of between just 25 cm – 45 cm tall makes them an ideal choice for discreet outdoor growing, generating a large central cola and few side branches. Their automatic flowering and reduced growing period do lead to lower yields than regular and feminized seeds, but the creeping, cerebral high generated by Lowryder Marijuana is potent and long-lasting. 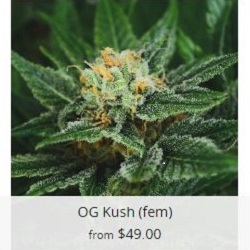 OG Kush is an award winning Marijuana strain, highly prized and sought after from the Amsterdam Coffee-shops to the American Medical Marijuana dispensaries. One of the most unique and unmistakable Marijuana flavors and aroma’s available. A perfect strain for the indoor grower, producing squat, bushy plants with multiple budding sites, perfect for both Screen-of-Green and Sea-of-Green growing techniques. Generous THC levels produce an energizing, creative high, perfect for sociable and daytime smoking. The dominant 95% Indica genetics produce a fast maturing plant, capable of reaching peak maturity in just 55 days given good indoor growing conditions. A famed, All-American strain with firm Chemdawg roots. Loved by growers, recreational and medicinal smokers everywhere. 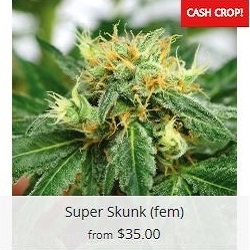 Super Skunk seeds were developed for Skunk Marijuana lovers everywhere. Very strong and extremely pungent buds offer great ‘bag-appeal’ with its own distinctive Skunk aroma. A hybrid Marijuana strain containing 90% Indica genes, producing stable, uniform plants with a reduced size and above average yield. Perfect for indoor growers, especially more more experienced growers looking for a good Sea-of-Green or Screen-of-Green strain to grow. Super Skunk is extremely pungent and will quickly fill the room with its strong aroma when flowering. Once dried and cured the buds have a sweet citrus flavor and spicy aroma. Expect a strong ‘body-stone’ effect that can be overpowering and ‘couch-locking’ for many light-smokers. Veteran smokers will enjoy the clear, crisp cerebral high. Super Skunk seeds are very forgiving of many of the common, minor mistakes made by beginner growers. A great strain for lesser experienced gardeners, performing well both indoors and outside during the Spring, Summer and Fall months. 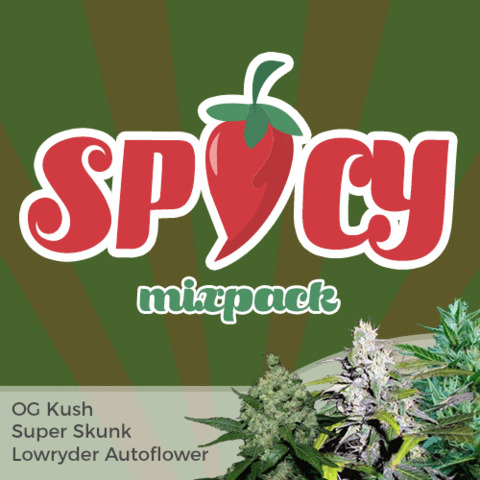 Spicy Mix Pack Seeds are included in the delivery guarantee, promising you 100% guaranteed delivery of your seeds. If for any reason your seeds fail to arrive, replacements will be dispatched quickly, and totally free of charge. I Love Growing Marijuana pride themselves on their first-class service, providing the very best customer care and support, from purchase to harvest.